Composed by Leonard Bernstein (1918-1990). BH Piano. American, Collection, Classical, Contemporary. 18 pages. 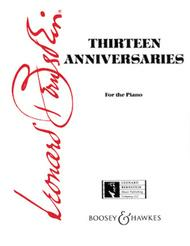 Boosey & Hawkes #M051244638. 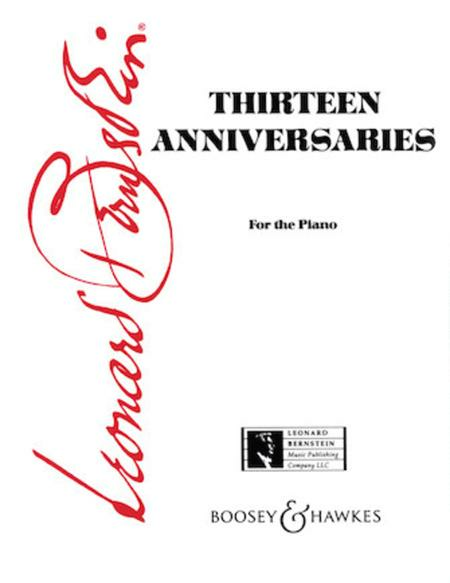 Published by Boosey & Hawkes (HL.48002521). Contents: For Shirley Gabis Rhaods Perle • In Memoriam: William Kapell • For Stephen Sondheim • For Craig Urquhart • For Leo Smit • For My Daughter, Nina • In Memoriam: Helen Coates • In Memoriam: Goddard Lieberson • For Jessica Fleischmann • In Memoriam: Constance Hope • For Felicia, On Our 28th Birthday (& Her 52nd) • For Aaron Stern • In Memoriam: Ellen Goetz.